Powered for the way you work, so your team can do business securely and productively wherever business take them. The Samsung Galaxy A6 gives your team the ability to work securely and productively from anywhere. Packed with innovative features that your employees will love, the Galaxy A6 is powered for the way you work. It's small enough to carry in your pocket, yet big enough to tackle the biggest business challenges. Get it all done with a powerful battery, expandable storage up to 400GB,² and compatibility with a wide ecosystem of app and accessory partners to address your unique business needs. When you get an Unlocked by Samsung smartphone, it has no pre-loaded carrier apps, so your organization can deliver a more predictable and consistent experience across devices and have greater freedom to customize device software. Bring photos, videos, websites and more to life on the expansive 5.6" Super AMOLED Infinity Display. The edge-to-edge screen maximizes your content with bright, rich colors while the sleek, metal casing fits right into your pocket. Empower your team to do more in the field and in the office, with less bulk. The Galaxy A6 is equipped with a powerful 3,000 mAh battery that can keep up with the demands of your work day. Whether your team’s in the office or in the field, the Galaxy A6 keeps them powered and connected wherever they go. 3GB RAM on the Galaxy A6 allows you to multitask quickly and effortlessly, so you can get everything you need to do, want to do and love to do, done. Keep it all with expandable storage. With 32GB of built-in storage,¹ and the option to add up to 400GB with a microSD card,² there’s plenty of room for all your files, videos and photos. The Galaxy A6’s camera makes your workforce more efficient. A 16MP high-resolution front and rear camera makes it easy for your team to capture clear, crisp images anywhere. Now, they can keep shooting even as the sun goes down, with an F1.⁷ aperture that helps capture legible documents and bright photos. Using facial recognition to unlock and access their phone quickly, your team can can get right to the task at hand whether answering an email, viewing a meeting notification or dialing into a conference call. Affordable, sleek and equipped with powerful Samsung technology, the Galaxy A6 is powered for the way you work. Now, your team can stay productive and connected anywhere, for a competitive price that works for businesses of any size. Unlocks securely with a touch, so your team can safely and easily access everything they need to get the job done. We make it easy to deploy and manage your workforce’s mobile technology from the moment your devices come out of the box. With Knox Configure, our cloud-based management solution, you can configure your devices, push security patches and deploy application updates, all remotely. Now it’s as easy to manage hundreds of devices as it is one. Type Provides who the cell phone carrier is for this model of phone. Find out how to address the growing tech gap between the C-suite and the next generation workforce. Get a comprehensive guide that provides an eight-step model for planning and rolling out a mobility initiative. 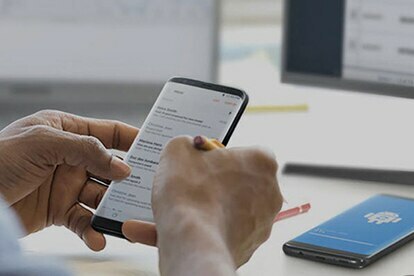 Learn how Samsung’s cloud-based management solution that lets you remotely manage, configure and deploy apps for your business’ mobile devices. 1Portions of memory occupied by existing content. 4Plans are sold based on MSRP or price end-user paid, whichever is less. Total duration includes one year of standard limited warranty. Labor-only costs for mechanical and electrical breakdown are covered from date of purchase. Both parts and labor costs are covered after the manufacturer’s warranty expires through the plan term. 5Samsung QuickStart Services are limited to configurations of fewer than 500 devices and a maximum of 8 user/administration groups. If you have specific requirements beyond those provided by QuickStart Services, including integration with third-party solutions, please contact your partner or your carrier, or email: samsungbusinessservices@sea.samsung.com. 6Devices will work on any compatible network. Wireless voice, data and messaging services are compatible with most GSM networks such as AT&T and T-Mobile and CDMA networks such as Verizon, Sprint and US Cellular. Support for certain rate plans, features and services such as VoWiFi and hotspot vary by wireless service provider. See provider for details. 7SIM card must be compatible with area’s available networks. International calling, data services and coverage vary by network provider. Contact provider for details.